New 5th Edition Now Available! 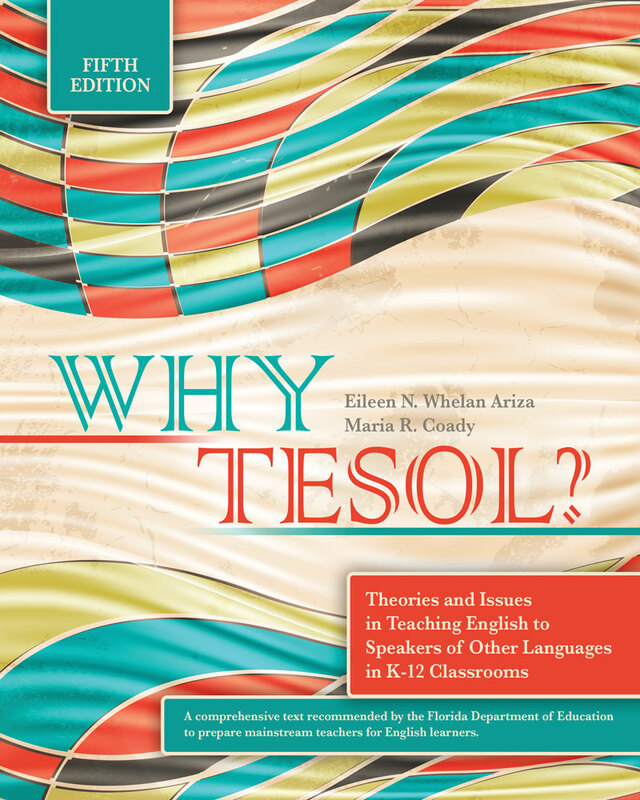 Why TESOL? Fifth Edition, provides classroom and preservice teachers with a knowledge base to effectively teach in culturally and linguistically diverse classrooms in today’s global environment. It provides in depth theoretical background, legal information, and application for teachers to address the needs of English learners. Why TESOL? is written so teachers from various backgrounds and experiences can readily apply ESOL concepts to their individual mainstream classroom settings. Eileen N. Whelan Ariza received her Ed.D. in Multilingual/Multicultural Education from the University of Massachusetts, Amherst, and her MAT in TESOL, Spanish as a Second Language, and her Bilingual/Multicultural Endorsement from the School of International Training in Brattleboro, Vermont. A Teaching Fellow for many years at Harvard University's English Language Institute, she is a professor in Florida Atlantic University's teacher education program, and is ESOL Coordinator for the College of Education, where she prepares both prospective and current teachers in the undergraduate and graduate programs. A three time Fulbright Scholar to Mexico, Costa Rica, and Malta, Ariza has taught English as a foreign/second language methodology in several countries to teachers, and ESOL to students ranging from preschoolers to the elderly. Her primary research interests are in ESOL, both in the United States and overseas, cross-cultural communication, and preparation of mainstream teachers with English learners in their classroom. Ariza has authored and co-authored several popular textbooks (e.g., Not for ESOL teachers: What every classroom teacher needs to know about the linguistically, culturally, and ethnically diverse student. (3nd Ed). Boston, MA: Pearson; Why TESOL? Theories and issues in teaching English as a second language for K-12 teachers. (4th Ed.). Dubuque, IA: Kendall/Hunt Publishing, and over 85 peer reviewed publications. Dr. Maria Coady is an Associate Professor and program coordinator of ESOL and Bilingual Education at the University of Florida, Gainesville. She received her doctor of philosophy (Ph.D.) degree from the University of Colorado, Boulder in 2001, where she was a US Department of Education Title VII Fellow from 1997-2001. She also received her Master’s degree in education (M.Ed.) from Boston University in 1993 and Bachelor’s degree in business administration and international perspectives from the University of New Hampshire, Durham. Coady was among the first group of US students to live, work, and study in Buenos Aires, Argentina under the auspices of the Organization of American States in 1987 after the democratic presidential election. She subsequently lived in Paris, France, where she studied at the University of the Sorbonne and began her teaching career in English. Upon return to the US, Coady taught Spanish and English to students ranging from elementary to higher education; her teaching career has spanned 30 years. Coady continued to work and study abroad. Her dissertation work at the University of Colorado, Boulder, investigated bilingual education programs called Gaelscoileanna in the Republic of Ireland. Findings have been published in the prestigious journal Language Policy. Upon completion of her doctorate degree, Coady worked at Brown University’s Education Alliance from 2001-3 providing technical assistance to school districts and teachers. She subsequently joined the faculty at the University of Florida, Gainesville, as a scholar of bilingualism and bilingual education. Coady was awarded a competitive position on the US Department of State Fulbright Specialist Scholar roster in 2012. Her first Fulbright Specialist assignment was in teacher education at Krivyi Rih University in Ukraine, where she was awarded an honorary diploma in teaching in 2013. Coady completed a second Fulbright Specialist assignment at the University of Witwatersrand in Johannesburg, South Africa. Coady has also consulted internationally in teacher education in Ireland, China, Costa Rica, the Dominican Republic, and the United Arab Emirates. In Florida, Coady works closely with immigrant students and families, at the intersection of teacher education, bilingualism and biliteracy development, and social justice issues. In 2007 she became co-Principal Investigator of a prestigious five-year $1.2 million US Department of Education National Professional Development (NPD) grant, Project DELTA, that investigated the relationship between preservice teacher education and the academic learning of EL students. In 2016 she was awarded a second five-year NPD grant as Principal Investigator ($2.4 million), which examines the rural context of education, prepares teacher-leaders for ELs, and builds rural family engagement (Project STELLAR, Supporting Teachers of English Language Learners Across Rural Settings). In addition, she is working on the first cross national study of meta-literacy development among multilinguals in South Africa and the US (with Dr. Leketi Makalela). Coady is completing a book with Multilingual Matters on rural multilingual family engagement. Her publications can be found in the first TESOL Encyclopaedia of English Language Teaching and the journals TESOL Quarterly; the Bilingual Research Journal, TESOL Journal; Language Policy; and the Journal of Language, Culture, and Communication. Coady’s personal life is dedicated to the memory of her son Thomas (1992-2014), daughter Rachel, husband Tom, stepchildren Austin and Emily, and Nori, her multilingual, multicultural mini-labradoodle. View Chapter 18 "Meeting the Needs of English Language Learners"